Explore the management areas of Powell River Community Forest on Google Maps. The Interactive Map outlines the PRCF Area, engineered and future harvest areas, as well as roads and trails. View maps online or download the georeferenced Development Map for offline use on your smartphone in no cellular reception areas. Please contact Chris Laing if there are any questions or concerns regarding planned harvest or road building areas. Download the Trail KMZ file, to create your own hiking map in Google Earth. The maps have been compiled using data from various sources. 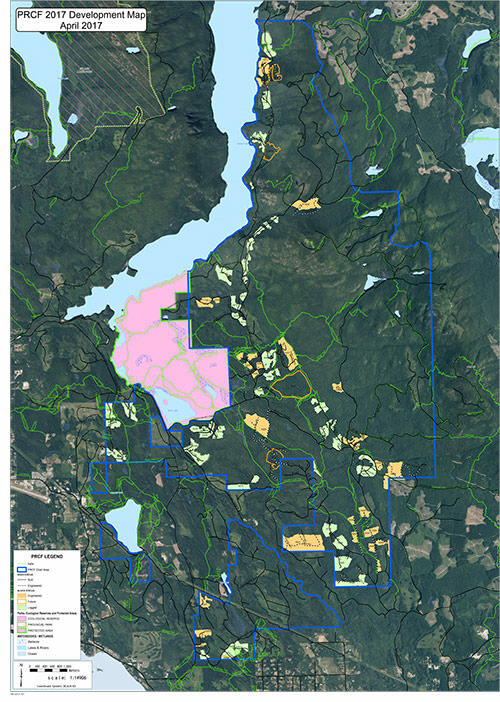 Powell River Community Forest Ltd. and the City Of Powell River is not responsible for any claims, damages or expenses whatsoever, including economic loss, resulting from any omissions, incompleteness or errors that may be contained in the maps. The maps represent information as it exists at the time the maps are transferred to the Powell River Community Forest Ltd. website and do not necessarily include any ongoing updates or corrections to the source databases maintained by the Powell River Community Forest Ltd. and the City Of Powell River or other agencies. The maps are supplied on an “as is, where is” basis. The Powell River Community Forest Ltd. and the City Of Powell River disclaims any warranty of merchantability or fitness of the maps for any particular purpose. In using the maps, the User releases the Powell River Community Forest Ltd. and the City Of Powell River from and agrees to indemnify the Powell River Community Forest Ltd. and the City Of Powell River from any and all claims, actions, causes of action, demands or suits whatsoever arising from or related to the use of the maps by the User. Powell River Community Forest Ltd.